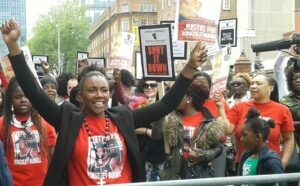 The Justice4Kingsley Campaign are calling for the community to support their event taking place in Birmingham on 30 March 2019. Meet at 1.00pm sharp at the Handsworth Cemetery Oxhill Road, Handsworth, Birmingham B21 8JT march to Newtown police station. PC Paul Adey has been dismissed but the notorious PC Mark Fannon and PC Paul Greenfield have walked away free of any charge and back in our community again at Newtown Police Station as first response officers serving our family and friends across Birmingham – Handsworth, Newtown, Aston, Nechells – amongst our community particularly the Black & Asian community who are disproportionately targeted. Kingsley Burrell, aged 29 years old, died in what appear extremely suspicious circumstances in Birmingham. It is reported that he called the police after he tried to talk to a group of young people who were intimidating him and his 5 year old son. He was subsequently arrested himself and detained under the Mental Health Act. Days later he was in intensive care and subsequently died. The march will be accompanied with Full Sound system in session, and afterwards there will be light refreshment, food and music continues @ the Light House, Youth Centre, 100, Alma Way, Birmingham, B19 2LN till 9.00pm. Applications for Bootcamp 16 are now open!